Despite the Israel Antiquities Authority's call to action, little has been done to preserve the ancient remains of a Roman road that are still visible in the area where Jesus traveled with two of his disciples on the day of his resurrection. A painting of the Emmaus Road encounter described in Luke 24 by artist Fritz von Uhde (1848-1911). Image courtesy of Wikimedia Commons. The Emmaus Road narrative is the climax of Luke’s Gospel. In it, two of Jesus’ disciples encounter their resurrected Lord as they follow the road leading west from Jerusalem. Not only do the hearts of the disciples burn as they speak with their risen Master, the hearts of the readers burn as well, since, unlike the disciples, we know that it is Jesus himself who is accompanying them as the disciples relate the sad tale of how all their hopes for the redemption of Israel were dashed when Jesus was crucified outside the walls of the holy city. Readers feel almost as if they were present with the disciples on the road as Jesus walked and spoke with them. Despite the importance of this story and its location for Jesus’ followers living in Israel today as well as for modern-day pilgrims who visit the land of the Bible, little has been done to preserve the ancient remains of a Roman road that are still visible in the area where Jesus traveled with two of his disciples on the day of his resurrection. A Roman tombstone found near Emmaus-Nicopolis. The inscription mentions the fifth Roman legion Macedonica, which according to Josephus (J.W. 4:443) Vespasian stationed at Emmaus in 68 C.E. before marching the rest of his forces to Jerusalem. Image courtesy of Wikimedia Commons. Identifying the village Luke referred to as Ἐμμαοῦς (Emmaous) has challenged ancient pilgrims as well as modern scholars. At least two sites bore the name Ἀμμαοῦς (Ammaous)—a slight variation in spelling from the name recorded in Luke’s Gospel—in the land of Israel during the Second Temple period. The book of 1 Maccabees mentions a location called Emmaus, which was situated near the topographical boundary between the Shephelah and the coastal plain (1 Macc. 3:40). Josephus referred to this Emmaus as a πόλις (polis, “city”), a term normally reserved for a large and well-organized population center. Perhaps this city ought to be identified with the אַמְאוּס (’am’ūs, “Emmaus”) mentioned in rabbinic sources (e.g., m. Arach. 2:4; Avot de-Rabbi Natan, Version B, chpt. 27 [ed. Schechter, 55]; Eccl. Rab. 7:7 §2), which is described as having a market (m. Ker. 3:7). The city was later renamed Nicopolis in the third century C.E. After the Byzantine Empire lost control of the Holy Land, Nicopolis reverted to the name ‘Imwas (derived from Emmaus) among the Arabic speakers who lived in the area. Coin of Elagabalus dated to “Year Two” of the foundation Nicopolis-Emmaus. Image courtesy of the Classical Numismatic Group. Remains of a Byzantine church at Emmaus-Nicopolis. Photographed by Todd Bolen, courtesy of BiblePlaces.com. Although a tradition emerged during the Byzantine period identifying Emmaus-Nicopolis as the Emmaus mentioned in Luke 24:13, the distance of this site from Jerusalem (some nineteen miles) contradicts the information given in the Gospel account. Luke described the disciples as going down from Jerusalem to Emmaus and back again to Jerusalem on the same day (Luke 24:33). But disciples traveling by foot would have been hard pressed to cover in a single day the thirty-eight mile round trip necessitated by an identification of Luke’s Emmaus with Emmaus-Nicopolis. Moreover, Luke 24:13 explicitly states that the distance to Emmaus was sixty stadia, that is, only about seven miles from Jerusalem. Therefore, despite the strong and relatively early Christian tradition equating Emmaus-Nicopolis with Luke’s Emmaus, this identification is unlikely to be correct. Four proposed locations of Luke’s Emmaus. Nicopolis was favored in the Byzantine period and still has its supporters among scholars. 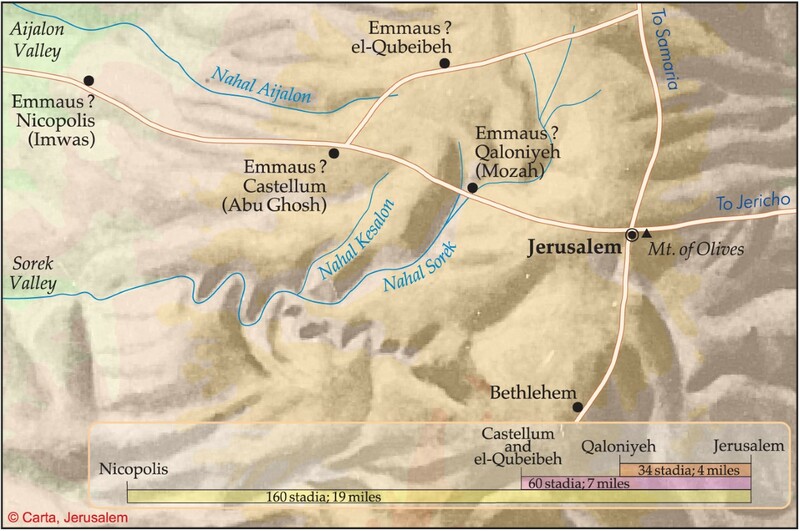 Castellum (Abu Ghosh) and el-Qubeibeh were favored in the Crusader period and are approximately located 60 stadia from Jerusalem, the distance indicated in Luke. Qaloniyeh (Qalunya)-Motza has recently found support among a handful of leading scholars. Map courtesy of Carta Jerusalem, used here with permission. The information regarding this second Emmaus accords well—though not perfectly—with the details of Luke’s narrative. Unlike Emmaus-Nicopolis, which Josephus referred to as a πόλις (polis, “city”), Josephus calls this other Emmaus a χωρίον (chōrion, “place,” “field”), which is closer to Luke’s description of Emmaus as a κώμη (kōmē, “village”). The distance Josephus measures between this Emmaus and Jerusalem (about three and a half miles) also fits with Luke’s description of the disciples making the journey to Emmaus from Jerusalem and back again on the same day. Nevertheless, one hitch remains. While Josephus states that this Emmaus was thirty stadia distant from Jerusalem, Luke 24:13 measures the distance as sixty stadia, twice the distance reported by Josephus. This discrepancy might be overcome, however, if we were to suppose that Luke cited the entire distance the disciples traveled the day of Jesus’ resurrection on their round trip from Jerusalem to Emmaus and back again, instead of the distance between the two locations. Commenting on this mishnah, the Jerusalem Talmud adds that according to Rabbi Tanhuma, a fourth-century C.E. sage, “Kalonya [קָלוֹנְיָיא, qālōnyyā’] was its [i.e., Motza’s—DNB] name” (y. Suk. 4:3 [18b]). The Babylonian Talmud ascribes the same statement to an anonymous tannaic authority (i.e., a baraita), adding that the name Motza was derived from Kalonya’s exemption from imperial taxation (b. Suk. 45a). Steps leading down to one of Motza’s springs. Each year orthodox Jews come here to get water for baking their matzah for the Feast of Unleavened Bread. Photographed by Lucinda Dale-Thomas, spring 1992. This rabbinic evidence is invaluable for identifying the location of Luke’s Emmaus for three reasons. First, the name Kalonya and its tax-exempt status connects the Mishnah’s Motza to Josephus’ second Emmaus, the one that became the location of a Roman veteran’s settlement. This is because the most plausible explanation of the name Kalonya is that it comes from the Latin word colonia (“colony”), a term that could have loosely applied to a veteran’s settlement. Moreover, a tax exemption would have been a natural incentive to encourage the Roman veterans of the war to settle the area. Second, if the Emmaus-Motza-Kalonya identification is accepted, the Mishnah’s evidence of a Jewish presence at Motza lends credibility to Luke’s account of disciples traveling, perhaps even returning home, to Emmaus. Archaeological discoveries also indicate a late Second Temple-period Jewish presence at Motza. Third, the rabbinic description of Motza as merely a מָקוֹם (māqōm, “place”) matches Josephus’ characterization of Emmaus as a χωρίον (chōrion, “place”), both of which are compatible with Luke’s reference to Emmaus as a κώμη (kōmē, “village”). Thus, the combined evidence from Luke’s Gospel, Josephus and rabbinic literature strongly supports the identification of Luke’s Emmaus with Motza-Kalonya. Distance from Jerusalem: 60 stadia (round trip?) 30 stadia “Below Jerusalem,” evidently within easy walking distance. Status: Became a veterans’ settlement. Called Kalonya (קָלוֹנְיָיא, “colony”). The “place below Jerusalem called Motza” referred to in the Mishnah is mentioned as early as the book of Joshua, where it is assigned to the tribal allotment of Benjamin. The book of Joshua refers to Motza as הַמֹּצָה (hamotzāh, “the Motza”; Josh. 18:26), spelled with a final ה instead of an א as in the Mishnah, and with the definite article prefixed to the name. Whereas the translators of the Septuagint rendered ha-Motza in Josh. 18:26 as Αμωσα (Amōsa), Josephus appears to have transliterated ha-Motza as Ἀμμαοῦς (Ammaous). If this analysis of the name Ἀμμαοῦς is correct, then Luke’s Ἐμμαοῦς (Emmaous, “Emmaus”) is best understood as an independent transliteration of ha-Motza, again with the definite article, which the author of Luke found in his written source. A willow tree (salix acmophilla). Image courtesy of Wikimedia Commons. The Mishnah’s association of Motza with willow trees suggests that the name “Motza,” literally “that which brings forth,” refers to the springs that water the valley where Motza is located, since willows prefer to grow in places where there is a permanent source of water. The word מוֹצָא (mōtzā’) in the sense of spring is attested, for example, in Isaiah 41:18, which refers to מוֹצָאֵי מָיִם (mōtzā’ē māyim, “springs of water”). Doubtless the Romans chose to found a colony at Motza in part because of the permanent springs that watered the valley there. The Romans must also have been attracted to this location by the fact that just to the north of Motza the valley broadens, offering a pleasant and spacious area for settlement. Since the valley was well watered and had rich soil, it was an excellent spot for agricultural development. Another advantage of Motza’s location that made it suitable for a Roman veterans’ colony was its strategic position protecting the ascent to Jerusalem on the road leading from Jaffa. The hilltop village shown in the center of this photo is Motza Illit. On the slopes across the highway from Motza Illit was the Arab village (until 1948) of Qalunya. Photographed by Horst Krüger, February 2003. An aerial view of the Motza neighborhood photographed by Moshe Milner. Courtesy of Israel’s National Photo Collection. Because I found the above-cited evidence regarding the location of Luke’s Emmaus at Motza-Qulonya to be compelling, I conducted an experiment to put this hypothesis to the test. On October 2nd of the year 1987, I walked with my son Natan from the Western Wall of the Temple Mount (the Kotel) to the springs at Motza following the route of the Roman road (on which, see below) as closely as possible in order to measure how long such a journey would take. It was the eve of Yom Kippur, so no vehicles were moving on the streets to slow us down, and we set out from the Western Wall at 6:10 p.m. under a full moon, walking at a leisurely pace. Together we covered the distance from the Western Wall to the Motza springs in one hour and twenty minutes. My experiment proves that Jesus’ disciples could easily have made the trip down from Jerusalem to Motza-Emmaus and back again within the time frame Luke describes. According to Luke, the two disciples who were heading to Emmaus set out from Jerusalem sometime after morning, for they knew of the women’s report of the empty tomb (Luke 24:22-24), but it could have been as late as mid-afternoon. The disciples did not head back to Jerusalem until after they had sat down for their evening meal in Emmaus (Luke 24:29, 33). View from the hill upon which the Arab village of Qalunya was situated facing east toward Jerusalem up the valley through which the road to Emmaus once ran. The Har Hamenuhot cemetery, the light colored structure in the center of the photo, now dominates the landscape. Photographed by Horst Krüger, February 2003. Even if readers do not find the identification of Luke’s Emmaus with Motza-Qalunya convincing, we can still agree that the remains of the Roman road that runs down from Jerusalem past Motza to Emmaus-Nicopolis marks the route Jesus and his disciples took to Emmaus on the day of Jesus’ resurrection. The pink shading shows the area where the remains of the Roman road from Jerusalem to Emmaus are still (barely) visible. When I first became acquainted with the Roman road near Motza, some of the pavement and many of the curbing stones were still clearly visible. Sadly, over the past recent decades I have watched as the Roman road has fallen prey to severe erosion, such that in many places the remains of the road have been completely obliterated. The IAA’s report notes that the condition of the Roman road is poor, adding that “the road in its present state is torn up, and often it is accompanied by the smell of sewage.” The odor of which the IAA’s report complains, is undoubtedly caused by the sewage pipe, which follows the path of the ancient Roman road. The Mekorot pumping station, part of the National Water Carrier, located near the village of Ramat Motza that boosts the water piped from Israel’s costal plain to Jerusalem. Part of Mekorot’s “Fourth [Pipe]line.” Photographed by Lucinda Dale-Thomas, spring 1992. A sketch of the remains of the Roman road to Emmaus drawn by Margaret Dickinson, a member of a Bill Bean (CSBR) tour group which David Bivin took to visit the site. The natural beauty of the Emmaus road was initially marred by the installation of a pumping station and enormous water-main that supplies Jerusalem. Much of the physical damage to the Roman road, however, can be attributed to the expansion of the Har Hamenuhot cemetery, mentioned above. Covering two large hills along the modern highway leading from Tel Aviv to Jerusalem, the cemetery has slowly crept down the southern slope of the southern-most of the hills towards the ravine through which the Roman road ascended from Motza to Jerusalem. During the course of the cemetery’s expansion, huge boulders were knocked down the slope by the unsupervised bulldozers at work above. These boulders crashed into everything in their path, knocking down the forest of 50-year-old cedar and pine trees that once lined the Roman road. The boulders also flattened picnic tables and slides and swings used by children of the families who came to this formerly beautiful spot on recreational outings. The cemetery construction also ruined monuments and memorial plaques honoring those who had donated to Keren Kayemeth LeIsrael (Jewish National Fund) to create the recreational area where the remains of the Roman road are now barely visible. The series of slides from the years 1992, 1997, 1999, 2003 and 2016 featured below is a testimony to how much of the Roman road has already been irrevocably lost. Most archaeologists are of the opinion that the network of roads the Romans built in the land of Israel was not constructed prior to the period of the First Jewish Revolt (ca. 70 C.E. ), and that the most extensive Roman road construction took place during the reign of Hadrian in the second century C.E. The earliest dated milestone belonging to a Roman road in Israel is from 69 C.E. Despite the probable construction of the Roman road near Motza after the time of Jesus, the route it follows traces the same path Jesus and his two disciples followed to Emmaus. The ravine is so narrow that any road built in it could not have been more than a few meters to the left or right of path on which Jesus and his disciples walked. It is therefore a shame to see the remnants of this potent reminder, which has withstood the passing of so many centuries, disappearing so dramatically in so short a time. This relief from Trajan’s Column (erected 113 C.E.) depicts Roman soldiers engaged in road construction. Image courtesy of Wikimedia Commons. The IAA’s report on the Roman road near Motza states that although “the road has been badly damaged, with proper restoration there exists a high potential for developing the road as a scenic route for hikers (‘pilgrims’) from Motza to Jerusalem.” Fourteen years on from the writing of the IAA’s report, the window of opportunity for this dream to be realized is closing rapidly. I fear that soon we may have to bid the Emmaus road a final farewell. Perhaps it is a good reminder that what is built by flesh and blood has its season and then is no more, while those whom Heaven has acclaimed endure forever. I wish to express my gratitude to Professor Ronny Reich and Dr. Stephen J. Pfann for directing me to useful resources on Roman roads in general, and concerning the Emmaus road in particular. I would also like to thank all those who contributed photographs to this article including Gary Alley, Gary Asperschlager, Lucinda Dale-Thomas, Chris deVries, Horst Krüger, Diane Marroquin, Joshua N. Tilton, Israel’s National Photo Collection (Photography Dept. of the Government Press Office), the Classical Numismatic Group and Wikimedia Commons. Special thanks are due to Carta Jerusalem for allowing me to use their map of the various possible locations of Luke’s Emmaus. In addition, I would like to thank Brian Becker for making the slideshows, which are such an essential part of this article, possible on JP’s website. Finally, I wish to thank Joshua N. Tilton for his assistance in preparing this article for publication. The Shephelah is an intermediate zone of low rolling hills that forms a north-to-south band between the coastal plain and the hill country of Judea. Certainly the Emmaus referred to in the Jerusalem Talmud passage cited in the footnotes above is to be identified with Emmaus-Nicopolis. It is reasonable to suppose that the same Emmaus is referred to in all of the rabbinic passages we have cited. Hi! David N. Bivin, could you please kindly provide the GPS coordinate for the ancient remains of a Roman road as the top picture posted. Leviticus 23:40 names “goodly fruit” — which at some time was identified as the Ethrog, or Citron; palm branches, “leafy trees”, AND willow. So — “four species.” The “leafy” one settled on Myrtle at some point. Does anyone know the time line on which these identifications were made & agreed upon? Mosaics on synagogue floors, and the Dura-Europos Synagogue, feature the Ethrog in antiquity, certainly. The Mishnah refers to ‘fulfiling the commandment on the Willow’, but not the other three types. The Mishnah often seems to abbreviate severely, leaving the reader to “fill in.” Do the Temple Institute folk have particular sources for the other three species now? — Might they ALL have grown at Motza in antiquity? Willow comes in all manner of varieties, some with long wands, which could “bow over” more easily than the shorter-branched varieties… The one pictured in this article seems to be of the “shorter-branched” sort. — Is it the local variety at Motza, or elsewhere? I understand that the Myrtle native to Israel is white-blossomed only, & that the branches were charred at an earlier time in the year, to force growth at Tabernacles-time. This is some careful Agricultural Management! Some sort of “united agricultural effort” to produce the lulav for use of pilgrims (200,000+??) would make sense. Were these not supposed to be “fresh” each day, for the eight days of the Feast? — Think of the work involved to produce that much Greenery!! Could Motza have been that kind of Plantation for the Temple? If so, it must have looked like a Judean vision of Eden! As to the Latin veterans settled at Colonia, I suggest that the agriculture already there was simply Expropriated. It wasn’t as if the land were “vacant” and unworked. Any vineyards, groves, orchards, fields, or whatever, the Roman vets likely just seized, kicked out the previous owners, if still alive, & enslaved any workers. Who can say what role in the Revolt the residents of Ha-Motza may have taken? It was “prime real estate”, to be sure; but if its inhabitants had been a “hotbed of resistance”, the likelihood of retribution was so much the higher. It strikes me that the route to Jerusalem would be of such key importance to Rome that its engineering would have been among priority projects after Pompey, long before Titus or the wicked Hadrian; but that’s just a hunch. — Maybe a Roman milestone still lies hidden there?? Given that Ein Kerem seems to have been a Levitical “priestly village,” is there any evidence that Motza was the same? The Herodian house you mention, what further details are there about it? It indicates a rather wealthy community. Carsten Peter Thiede, in his book, “The Emmaus Mystery,” says broken pieces of a kalal (large stone jar) were found at Emmaus/Colonia, taken as evidence of Jewish ritual observance, like that at Khirbet-Qanah in the Galilee. (St John 2) He says these were turned on great lathes, during the days of the 2nd Temple, but not afterward, thus providing a Terminus ad quem. Can you confirm any of this? It would be wonderful to get the ma’aleh Roma’im repaired for those “going up” to Jerusalem for the feasts of the LORD, as well as for those “going down.” Some judicious re-planting could conceal the huge development of Har-Hamenuot. Somehow the unsightly water main must be buried, without further damage to the remains of the old Road. Pictures of the smashed picnic area are frightening! Frankly, I think it was not ‘unsupervised’ work, but rather that letting the boulders tumble was cheaper than hauling them away! — But Imagine kids at play when those boulders crashed down! Jewish re-forestation gifts were squandered, too! Restoration can be a “Joint Project”. It would be best to see the Roman road-building method replicated, as near as may be, where the road has altogether disappeared. That in itself will be an interesting “experiment” — “living archaeology.” The IAA will learn a great deal from “actively recreating Roman road-building techniques” here. Such a project will find many Takers, I think. Thanks for a great article that sets the issue forth in a compelling fashion. Have the IAA made any response? With a little official promotion, people will arise to the challenge & assist in this restoration. Let me propose an “Emmaus Half-Marathon”, where participants would stroll out to Motza in the afternoon, and ‘run’ back to Mount Zion by the light of the just-past-full moon during the week of Pesach (Sunday, or another convenient day). I think this could attract a great & enthusiastic crowd. The Prize would go to the “Last Finisher.” The object would be to “do” it, not to “beat” all the other participants. Anyone up for that? Thank you for this rich and memorable article. Well I remember bringing groups to this very road for you to guide back in the day. Let’s hope the planning authorities leave us something of this heritage gem! An excellent article David! The pictures & videos are great blessings also. Motza is fairly easy to find particularly since the Temple Institute folks have begun the Willows from Motza tradition in their “practice ceremonies” of the water drawing, etc. at & from the pool of Siloam. But Emmaus has remained more of a mystery to me over the years. I for one really appreciate your (and others’) work on this. As always, Best Regards, Rob Wilson – CoM teaching elder.